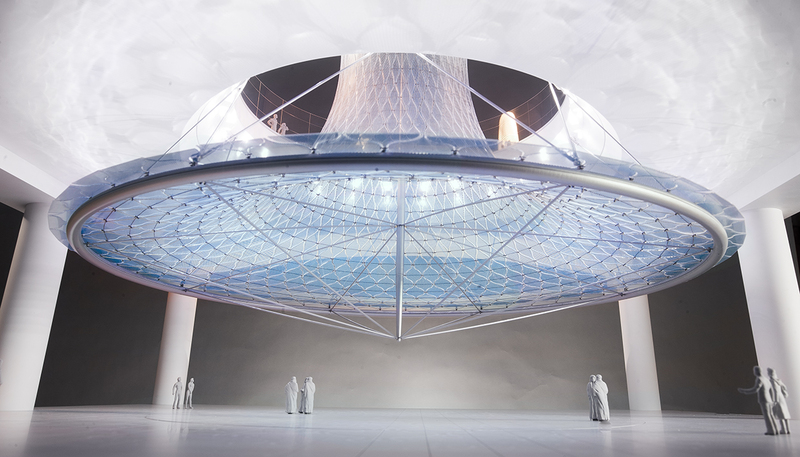 Sana Al-Nour was commissioned by the Abu Dhabi state airport authority (ADAC) as an integrated artwork to direct light and air between the departures and arrivals levels of the new Midfield Terminal at Abu Dhabi International Airport, currently scheduled to be opened in 2019. It is 30m diameter (approximately the diameter of the internal dome of St. Paul’s Cathedral, London) and 22m high – and is believed to be the largest public artwork in the region. 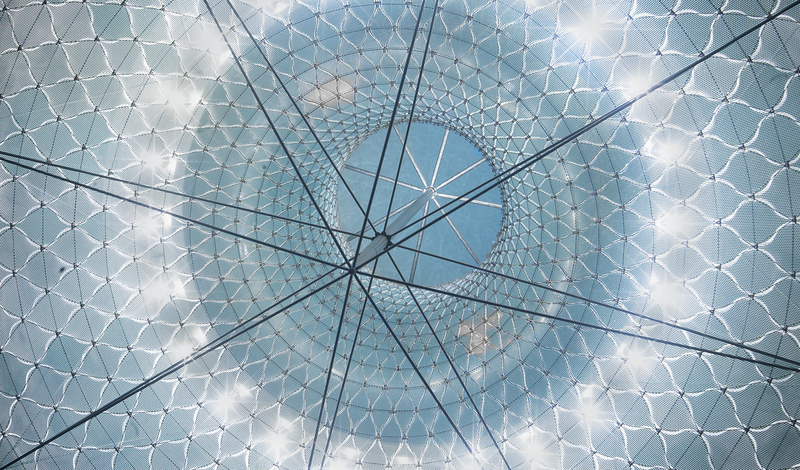 The artwork is unique in that it is integral to the experience of the daylight of the spaces, and also facilitates the energy-saving airflow design for the whole building. Sana Al-Nour is suspended in a space which is a total of approximately 70m high from ceiling of departures level to floor of arrivals. The efficient cable-net structure is tensioned between compression rings at top and bottom which are held apart by a central strut. Sixteen 50mm diameter stainless steel tension rods support the sculpture from the lower tip of the central strut. 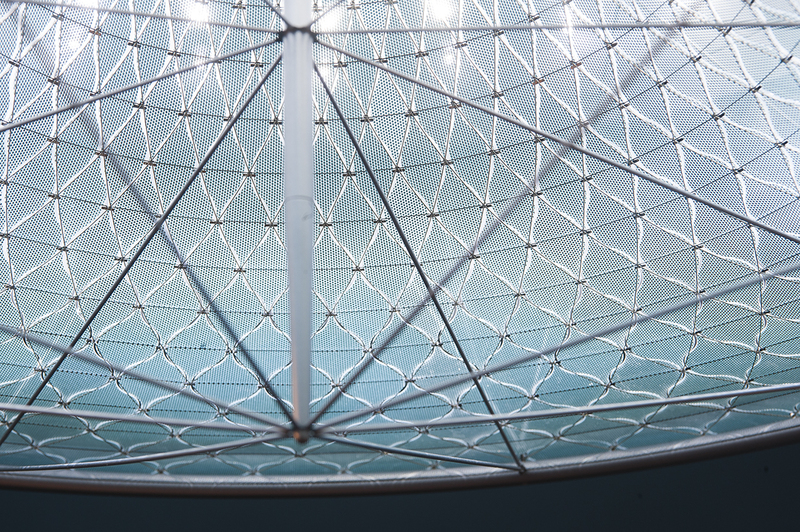 The total weight is approximately 100 tons and incorporates 1632 curved and chemically-strengthened glass panels. 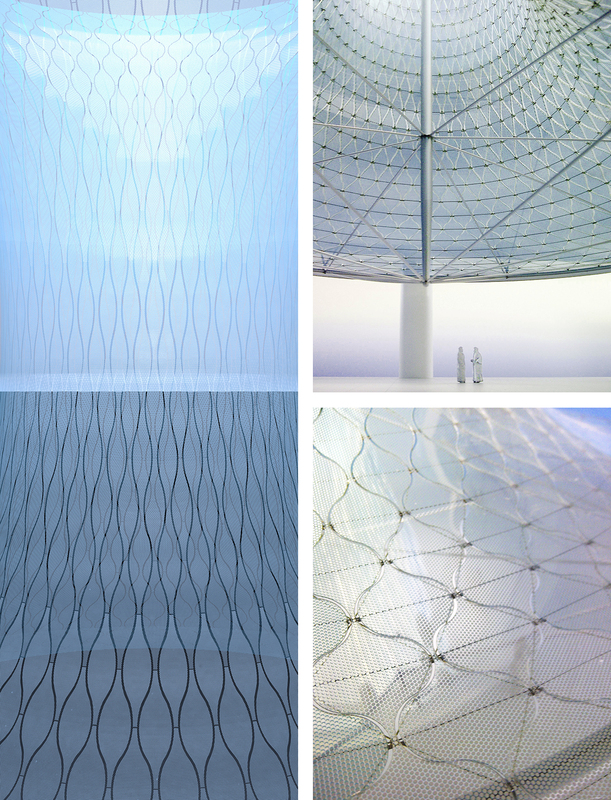 Their distinctive form is derived from the triangular form of the cable net grid, transformed by a slight curve in the edges of the panels, producing a fluid, rippling surface of glass leaves. The glass panels are laminated with a unique semi-reflective two-sided silver/blue interlayer, which was specially designed for the project. It incorporates two offset hole patterns which vary in size and offset distance to give an opacity from approximately 60% to 80% and also a variation in the proportion of blue and silver on either side of the glass. The sculpture is simultaneously form and surface. Aesthetically, it directs daylight from the huge, brightly-daylit departures space to the artificially-lit arrivals hall below it. The silvery, almost pearlescent, semi-transparent external surface also creates a landmark wayfinding device on the upper level, while the turquoise-blue internal surface creates a calm and welcoming space below. At night white and coloured LED sources within the void at the intermediate floor level use the sculpture’s surface to reflect light up and down, producing halos of light and further extending its presence to ceiling and floor. 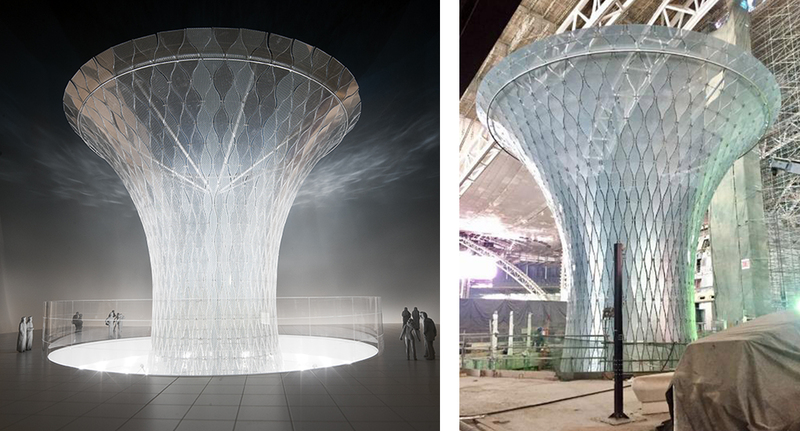 In addition, the sculpture aids the energy-saving air management strategy of the building by maintaining comfortable airspeeds at the passenger level, guiding both air and light from one space to the other. The form was checked for its airflow characteristics using computational fluid dynamics (CFD) software. Sana Al-Nour is completely unique, designed specifically for the space in which it is located and its daylight conditions. The sculpture shows an unprecedented level of integration and coordination between aesthetics and functional aspects of the building.